Default prevention service providers are tasked with reducing student loan delinquency and default. To make a positive impact, they use a customized combination of outreach methods, counseling practices and skip trace strategies. While these standard activities are part of each provider’s service there are certainly differences that make one vendor’s program a better match for your needs than another. The same thing can be said about pricing and fees. 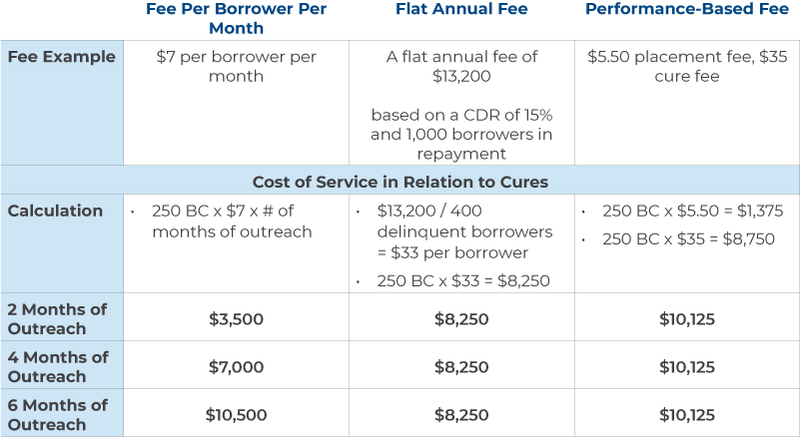 Just like there are multiple ways to engage and counsel borrowers, there are multiple pricing models for default prevention services. At first glance, pricing approach may not seem like a big deal, but there are some striking differences when you look at the details. So, just as you evaluate outreach and counseling services you’ll want to appraise pricing - run a few scenarios and make a pros & cons list. What, you don’t have time for that kind of research? With that in mind we thought it would be helpful to share what we know in this little version of a “Buyers Guide”. When determining which pricing model makes the most sense for your school, it’s important to keep your goal in mind. Is your school laser focused on lowering your CDR or do you want to help recent graduates manage significant indebtedness? It’s also important to know your borrower population, including your average delinquency rate (e.g., the estimated number of borrowers that will reach 60 or 90 days past due). 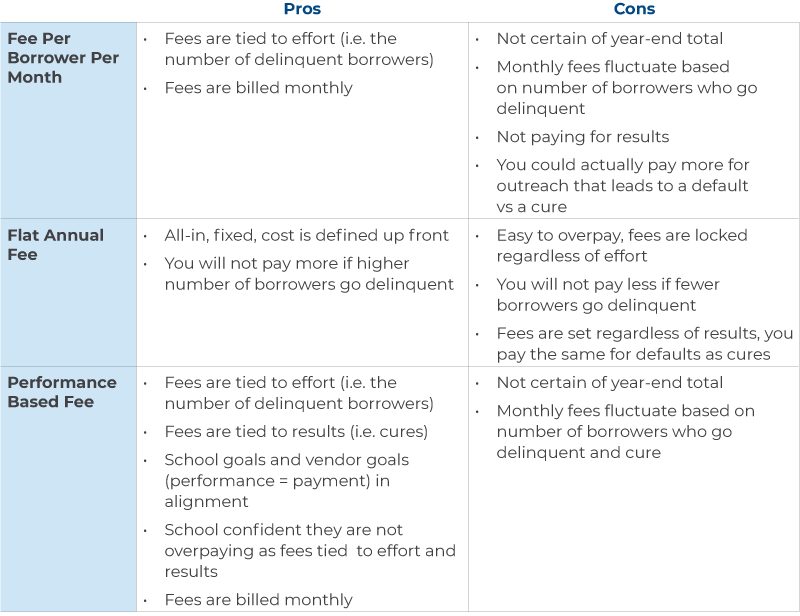 Pricing models use different factors to calculate fees. Some are focused on the number of borrowers who are currently delinquent and receiving outreach, while others count new cures and still others use historical data like the number of borrowers who have previously defaulted. So an apple to apple comparison can be a bit challenging. To help, we’ve defined a scenario, shared our assumptions and provided the math so you can see how these models stack up. Now let’s look at it from another perspective - how much would you pay when a borrower defaults? After 10 months of outreach (from day 60-360) 150 borrowers in our scenario failed to cure. And finally, let’s look at the total cost for services delivered to all 400 delinquent borrowers. Let’s add the cost of the cures to the cost of the defaults. And let’s assume for the fee per borrower per month, that the cures, on average, took 4 months. So math is one way to look at the different pricing approaches, but a simple pros and cons list can also help round out the comparison. Download this great information in a portable PDF. Price is definitely an important factor in default prevention services. But there is a cost to poor service that goes beyond fees. To wrap up this post we close with a little insight on quality counseling. Making comparisons between potential service providers can be done by asking a few poignant questions related to their counseling approach and staff expertise. How much training and coaching do counselors receive? A thorough plan should include ongoing call reviews, supervisor coaching, and training related to the constantly evolving student loan industry. What is their counseling approach? If the team uses call scripts and focus on warm transfers to servicers, the emphasis can be on turning over the fastest solution. Whereas, call modeling to gently steer conversations and three-way loan service conversations (were counselors advocate for borrowers) can result in better outcomes and long-term repayment success.